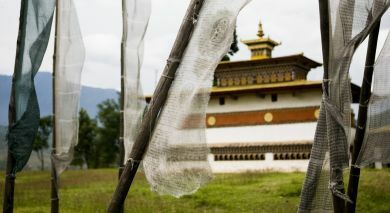 Swiss Guest House Bhutan is one of the region’s oldest lodges, offering you a charming stay in the lap of the Himalayas. This traditional Bhutanese guest house with a Swiss twist has its own tale to tell! 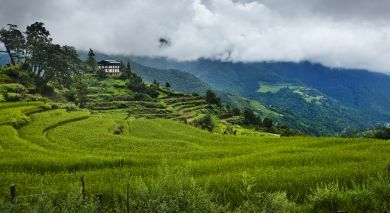 It was built on the grounds of a quaint, old farm house flanked by an apple orchard that once belonged to the family of the first King of Bhutan. Each of the spacious wooden rooms is comfortably furnished, offering charming views of the lodge’s fruit orchards and breath-taking views of the surrounding mountain peaks. Enjoy the cosy, homely feel of the guest house, curled with a well-loved book or take a leisurely walk along the lovely orchards. After a long day spent trekking outdoors, refresh yourself with a relaxing hot stone bath. Mealtimes are special with cheesy delicacies such as fondue and raclette, along with other Swiss favourites as well as traditional Bhutanese dishes.